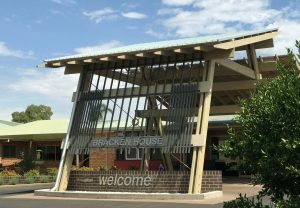 Located at 315 Macquarie Street, Dubbo, Bracken House is a 74 bed residential aged care facility, including 20 beds located in a fully secured dementia specific care unit. Our recent renovation and extension to Bracken House was completed in December 2016. This included an additional 20 new resident rooms added to the Facility, ie 8 beds were added to Lavender Lodge (Dementia Unit) and 12 beds added to Red Gum Lodge. Our facility has been refurbished to include modernized living areas, furnishings and equipment. All resident rooms are spacious and have their own ensuite. Meals are served in our dining room and residents are provided with a variety of choice every meal. There are daily activities, entertainment and/or outings on offer. A stroll through the grounds of Bracken House is nothing short of delightful. Quality care is provided to all residents to cater for their care needs. Lavender Lodge (Dementia Unit) is fully secured including a lovely outdoor area with a walking area, BBQ and birds in aviaries. A recreational activities officer provides activities or entertainment daily. Our Chapel located within the building of Bracken House allows our residents to attend weekly services, to fulfil their spiritual needs in their own time and a quiet place to reflect. Funerals and remembrance services are also conducted from the Chapel. Our staffing includes 24 / 7 Registered Nurse coverage and doctors and other allied health services visit on a regular basis. Personal laundry is washed onsite and returned the same day. There are lovely courtyards with beautiful greenery and water features to enjoy time with other residents, family and friends. Our building is equipped with solar panels and a generator back up system in the event of power outages. Refundable Accommodation Deposit (RAD): – this is commonly referred to as the “bond” and is determined by Centrelink and based on the assessment of your income and assets. The full RAD for Bracken House is $450,000. Bracken House is part of the Western Region of the United Protestant Association.